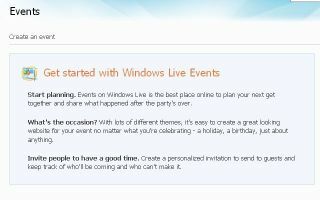 Windows Live Events is set to close – with Microsoft looking to push users over to Windows Live Calendar. People will no longer be allowed to enter new events in Windows Live Events from next month, and eventually the site will redirect to the Windows Live Calendar service. "In order to focus and prioritize our resources on Windows Live, we are retiring Windows Live Events and encouraging people to use Windows Live Calendar for their event organizing needs," a Microsoft spokesperson told Ars Technica. "With Windows Live Calendar we're making it easier to manage and share your events, to-do lists and reminders all from one place." Live Events was a service set up to help plan get-togethers, something that the likes of social networking sites like Facebook have done very well. However, with Live Calendar including much of the same functionality, it makes sense for users to be ported over.